Just wanted to let you know that these easy, make-ahead breakfast delights are sponsored by my friends over at Flatout! This Southwestern Breakfast Burrito uses taco seasoned, roasted acorn squash to give it a sweet and spicy flavor! Gluten free, protein packed and perfect for busy mornings! New life fact that I just decided RN: Monday’s are for MEXICAN. Which means, if you A-L-S-O observe “taco Tuesday,” you are eating Mexican food two days. IN A ROW. I can already tell that, like me, you are VRY VRY okay with that being a real thing that happens in your food-eating-life. Although I love Mexican food (hello Mexican Zucchini Lasagna on repEAT) I thought you might be just a little, teeny-tiny bit angry if Mexican Monday was also based around some kind of tacos-for-dinner-situation at your dinner table. So, uhhh, the next logical meal would be BREAKFAST. Are you following me on Instagram? If so, you already know that 99.5% of my posts are about breakfast. I wake up and eat it. Think about what I ate all afternoon. Once the evening rolls around, I start thinking about what’s for breakfast TOMORROW. Don’t lie. You secretly do this TOO. #BreakfastSoulMates. 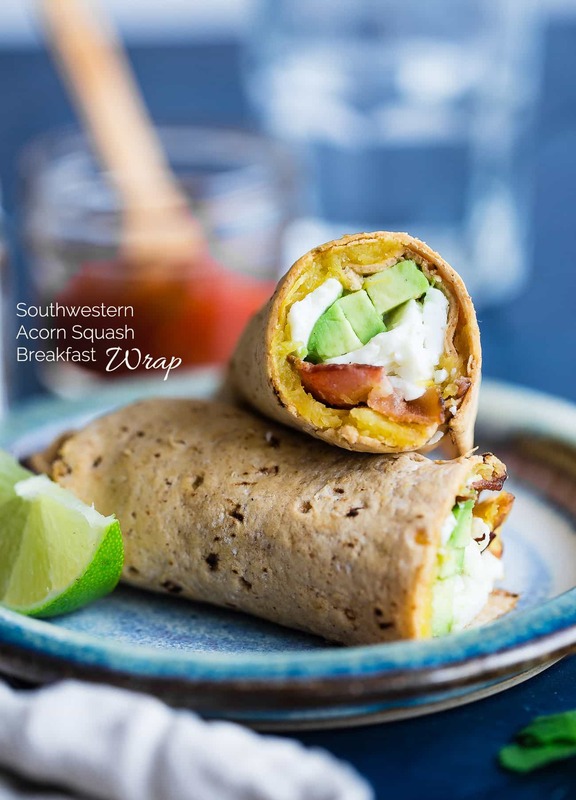 This little Mexican Breakfast Wrap is definitely going to fall into your “think-about-it-all-afternoon-dream-about-waking-up-to-it-all-evening” box of food thoughts. It’s got all the spicy cumin! Paprika! Chile! Flavor that your little mouth expects when the promise of Mexican food is on the horizon. Side note: if you’re not a lover of the egg white, you could most CERTAINLY use full-on scrambled eggs. Yolks and ALL. You do you, fellow breakfast lover. Ps: you do need to know that aforementioned egg whites ARE cooked in bacon fat. Which makes their delicious factor about a 42 on a scale of DON’T EAT EVER to EAT AT EVERY MEAL FOREVER AND EVER OKAY THANKS BYE. You know me too well though right? You KNOW that I wouldn’t make something SO predictable. I mean, I did feed you green cashew curry chicken bowls with watermelon remember? We don’t DO “expected” ‘round these parts of the interwebz. So. TACO ROASTED ACORN SQUASH. You remember the kabocha squash soup in the slow cooker, where I professed my squash love, so it should come as NO REAL surprise to you that Taylor-Brain decided that squash+Mexican+Monday+Breakfast = good life choice. Internet friends. I think we’re onto something with the mish-mash of flavors that is ULTRA creamy roasted acorn squash, with its perfect notes of natural sweetness that play REAL nice in your mouth with all the south-of-the-border spices. And with SALTY BACON? COME ONNNNN. 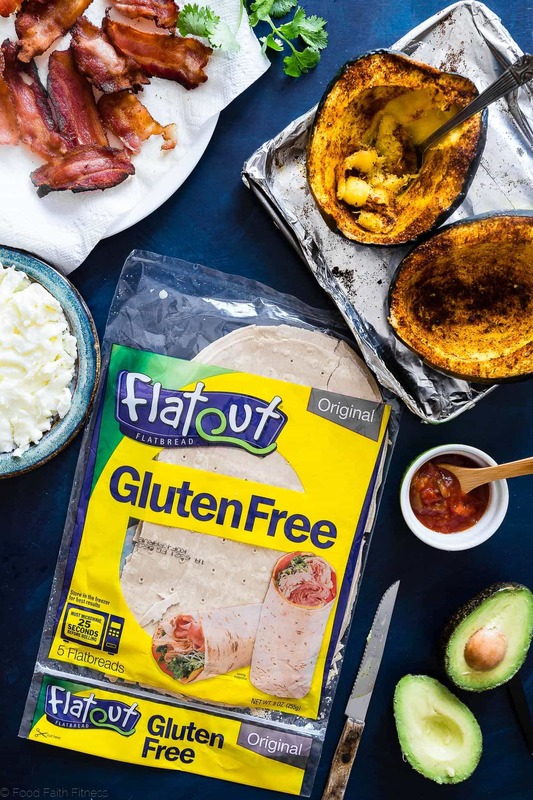 Just like the pesto freezer breakfast burritos from a few months back, the base of our swanky little breakfast wrap from the south is Flatout Gluten Free Flatbread. It’s got that perfect chewy-carb factor that our mouth craves when noshin’ on a wrap. Have you ever ordered one from a café, were SO excited about all the goodies inside and then bit in only to discover the actual wrap itself just DISINTEGRATED IN YOUR MOUTH? This is not that. Flatout is TUFF (and delicious!) stuff that stands up to the HEAVY-HANDED slather of velvety smooth, roasty squash goodness that mingles in your mouth with EVERY BITE. Dear Super squash Mexican Breakfast Mondays. We like you. Please stay with us forever and ever. Preheat your oven to 400 degrees and line a baking sheet with tinfoil. Slice the squash in half and scoop out the seeds. Rub it with the oil, and the the taco seasoning. Bake in the preheated oven until soft and fork tender, about 40-45 mins. Let cool for 10-15 minutes, or until cool enough to handle. While the squash cooks heat a large pan on medium heat and cook the bacon until golden brown and crispy, flipping once. Transfer to a paper-towel lined plate and press out the excess oil. Discard any excess bacon fat from the pan, but leave enough to cook the egg whites. Keep the pan on medium heat and add in the liquid egg whites. Cook until they look fluffy and set. They firm up a lot as the cook, so don't overcook them. Transfer to a cutting board and roughly chop them. Scrape the squash out of the skin into a large bowl and use a fork to mash it up until smooth. 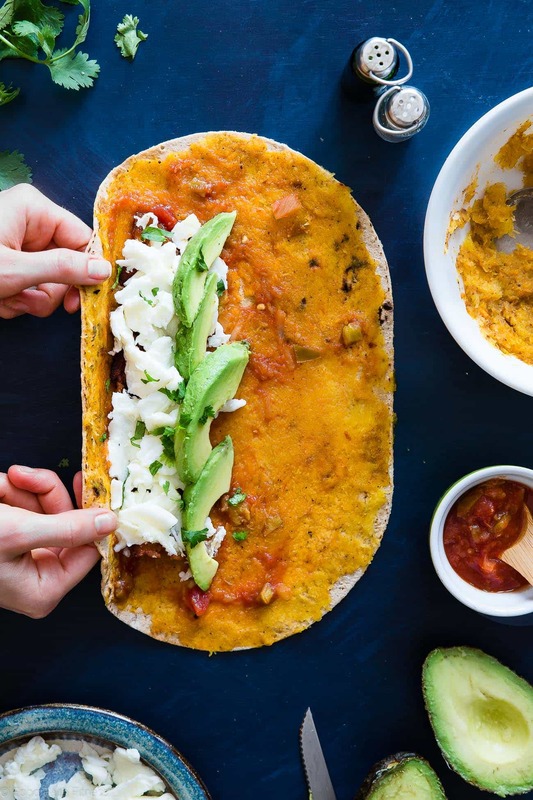 Spread 1/4 of the mashed squash all over 1 of the wraps, followed by 1 1/2 Tbsp of salsa. Lay one bacon strip down the edge of the wrap horizontally followed by 1/4 of the chopped egg whites. Finally, place 1/4 of the sliced avocado on top. Sprinkle with a little bit of cilantro and a pinch of salt. Roll the sides in first, and keep them tucked in tight while you roll the wrap up lengthwise. Want to find Flatout Near You? CLICK HERE! What a marvelous breakfast! So flavorful and delicious, I’d eat this again for lunch! Haha I love your style! Thank you! This is so smart! I love butternut squash at all meals but I love this breakfast idea, AND I have a squash I need to use today! Love the Southwest take on these, can’t wait to try them! I hope you love this Deryn! I am also a squash lover!! I will never say no to a breakfast burrito!! 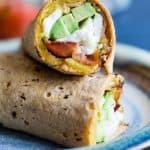 I love breakfast burritos–these look so delicious and perfect for fall with that acorn squash in it! Creamy squash with creamy avocados all wrapped up in a portable meal?! YES. PLEASE. These sound so flavorful and delicious! I love that you added acorn squash. Yum! Such a great use of acorn squash. these sound delicious! What? With acorn squash? How smart and delicious, girl!! It’s such a fun twist! Thank you! This is Breakfast of champs! Love all the little things you can make with FlatOut! What a brilliant idea! I love acorn squash. My kids, notsomuch. This would be a great way to get them to eat it! This sounds incredible! I should stock my freezer with these for breakfast all autumn long! I 100% agree that you should! Love the addition of squash in these breakfast burritos! What a fantastic way to start the day! Love the southwestern flavors going on! This looks amazing! I can’t wait to try it – loving the acorn squash! Oh I think about breakfast non stop! These sound amazing! I never think to use acorn squash! I don’t either, which is why I made myself here and now I need to do it more!! We do Mexican Mondays, Taco Tuesdays, Mexican Miercoles, and more during the week. Every day can be Tex-Mex day in our house. These breakfast burritos look so good, I would probably have them for lunch or dinner too! HAHA I LOVE that! Mexican ALL DAY EVERYDAY!!! Mmm… Roasted squash with eggs and avocados and all that Mexican flair sounds sooooo good! I bet you would love to Emily! Thank you! I’m so into squash right now, LOVE the idea of adding them to a breakfast burrito! I will forever be into squash! Ha! Thanks! Omg, Taylor! Well clearly this is a must try! I will be making these tomorrow for breakfast!! SOOOO GOOOD! Looks good! I think these could work for the whole family, leaving the bacon off mine and mini me. I have a lot of acorn squash to use up too! Woo hoo! I hope you love it Sarah! Thank you so much girlfriend! YAY Mexican! I am 100% onboard with Mexican Monday and Taco Tuesday back to back. You are a genius! I knew I liked you! 😉 Thanks!! This looks incredible girl! I’m totally on board for Mexican two days in a row. I could eat it everyday! You and me both girl! Thanks! 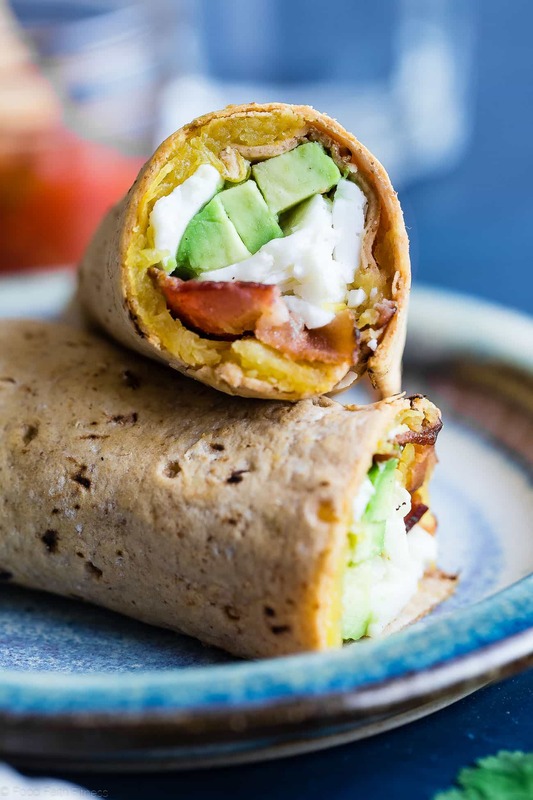 Genius idea to put squash into a breakfast burrito! You had me at bacon + squash! It’s such a good combo! Breakfast tacos/burritos are my favorite. Love this fall spin!